Xenesthis immanis (Ausserer/1875), also known as the “Colombian Lesserblack”, is a very stunning bird spider due to its size and coloration from Bogota, Colombia, clothed with deep olive-black woolly hairs on mature species. Especially mature males are shining stars with their bright and colorful appearance. As in Megaphobema spp. and Pamphobeteus spp. spiders from genus Xenesthis lack stridulating organs at the base of the pedipalps and the first leg. People easily confuse Xenesthis spp. with Pamphobeteus spp. due to the fact they appear to be the same by the typical purplish-red patches behind the eyes on the carapace. Nevertheless both genera are easily distinguished by the scopula pads on leg 4. All Xenesthis spp. show a larger scopula pad on the inner side of the fourth leg’s femur (ref. “The annals of magazine of natural history, 1901, Pocock, page 546”), where scopula pads on Pamphobeteus spp. are only apically present (look below). What you have to keep in mind in previous sentence is that Pocock was actually talking about the femoral brushing and not the scopula pads on the metatarsi of fourth leg pair. 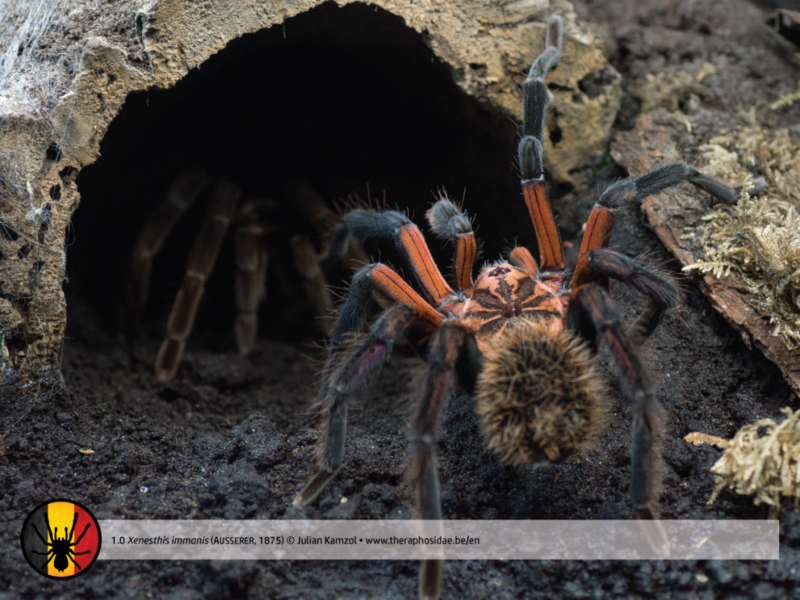 Xenesthis immanis shares her habitat with Pamphobeteus fortis and Pamphobeteus ferox in the region of Bogota in Colombia. However, little is known about their population locally as it is too dangerous for investigators to go out looking for Theraphosids in the dangerous hills of the region. 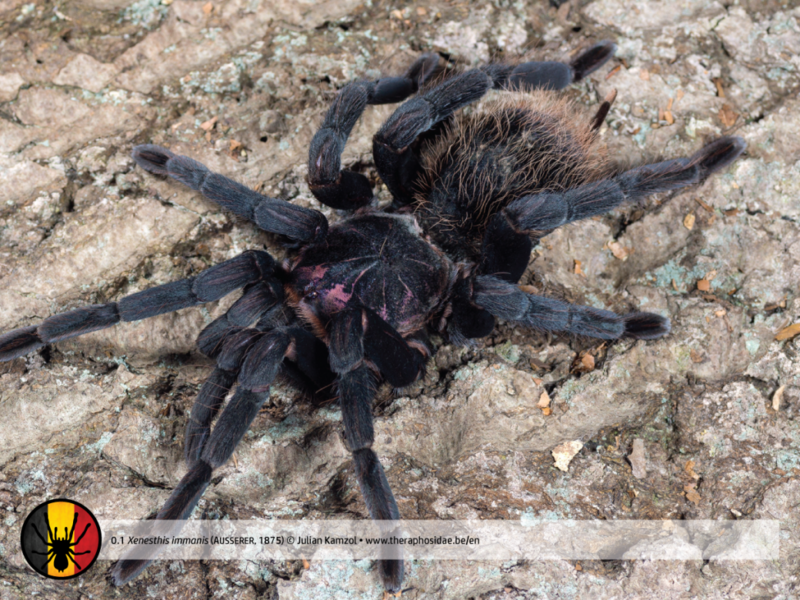 Previous name: Lasiodora immanis Ausserer, 1875, Xenesthis colombiana Simon, 1891h, Xenesthis immanis Pocock, 1901c. Type: Terrestrial bird spider. Opportunistic burrower. Urticating setae: Yes, abdomen (Type I. Type III as well, but only on males). Venom: Probably mild. No valuable scientific research has been done yet. Origin: Bogota (Colombia), Tachiro, Caracas (Venezuela), Ecuador. Different literature is mentioning presence in Panama as well. Type male is from Bogota. Type female is from Caracas. Life expectancy: Females become up to 12-15 years old. Males are given a shorter lifetime of 3-4 years. Behavior: The spider will try to flee at first, probably striking of urticating setae in the meanwhile. To do so they typically raise their abdomen. When kept properly Xenesthis immanis will be waiting at the entrance of her burrow by night for unexpecting prey to pass. Sexual dimorphism: Yes. Females are heavier than males. Males have about the same leg span and are more colorful than females. Xenesthis immanis lives in tropical warm and humid area. Temperatures almost daily reach levels up to 27°C with significant humidity levels every now and then, but… In their natural habitat they’ve been seen in rather deep holes, searching for a cooler and humid environment. Do not overheat your terrarium. Temperature: 23-27°C (day), 19-22°C (night). * Temperatures may reach minima as recommended from january until march. * Keep humidity around minimum from january until march, especially when you’re breeding. Adult: LxWxH: 40x30x35. Min. 3x span width in surface. Smaller than adult: 3x span width in surface. Adult: Around 0,75-1x span width. Smaller than adult: Min. 0,75-1x span width. * Keep substrate rather moist. * Xenesthis immanis is an opportunistic burrower. Please provide her this opportunity. * During 8-9 months the spider lives in very humid area. Note that cages with high humidity levels are very sensitive for mites. Please take your precautions. Wet season: April, may, june, july, august, september, october, november, december, january. Average rainfall around 1 out of every 2 days between june and november. Coldest months: None. The coldest month don’t differ that much from the other months. For more information about the local climate: Click here. * You might like to consider an adjustment of these data with your local climate. Do not exceed minima or maxima and, if necessary, organize the year making your bird spider experience different seasons. This is very important form the moment you’d like to start breeding. Xenesthis species differ from Pamphobeteus species by the extend of the wrapping of metatarsi scopulae on leg IV. Pocock (1901c) described the genus as having “scopulate to base” as a distinguishing feature compared to Pamphobeteus which has “scopulate apically”. In Xenesthis the scopulae generally wraps around the entire metatarsus, ventral to dorsal. However, this is not always the case and some species only have ventral-retrolateral scopulae as shown by Esche (2015). In Pamphobeteus the scopulae are ventrally present in the conventional fashion and generally covers about 1/4 distally. However, Schmidt (1995e) and Bertani et al. (2008) both report species in the genus with apical scopulae, which is more than 1/4. Metatarsal scopulae are not present ventrally on the metatarsus of any Pamphobeteus species. Mating Xenesthis immanis normally goes well. However, it might be rather difficult to find a thoroughbred couple in the hobby. • Only start breeding 4-6 weeks (or later) after the spider molted. If the female molts between pairing and cocoon, the eggs will remain unfertilized. • Make sure the female is well-fed (not obese) before you introduce the male. • Make both humidity and temperature drop to minima as shown above for 3 months. • 2-3 months after mating the female will retreat in her burrow. • 3-4 months after mating, from the moment you’re reaching higher temperatures and humidity, the female will start making the cocoon. Deprive the cocoon, when desired, 5 weeks later. Store the eggs at a humidity of 80-90% and a temperature of 24-27°C. Expect 50-100 spiderlings to come out. 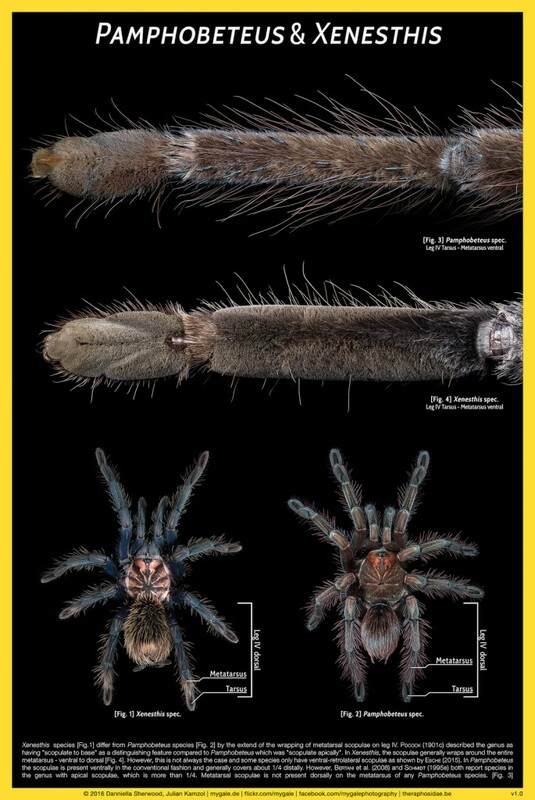 • Spiders from the genera Xenesthis and Pamphobeteus are easily distinguished by the size of their scopula pads on leg 4? • Mature males Xenesthis immanis are more colorful? • You often read Xenesthis immansis, but that’s wrong. Xenesthis immanis is the correct scientific name. • Pocock actually meant the femoral brushing when he wrote that “Xenesthis spp. show a larger scopula pad on the inner side of the fourth leg’s femur.” Don’t confuse this citate with the fact both genera differ from each other in the presence of the scopula pads on the metatarsi of the fourth leg pair. • Xenesthis immanis shows up in stories about the remarkable symbiosis with a Microhylid frog, Chiasmocleis ventrimaculata?  In 2002 however, Csakany corrected it to be a spider of the genus Pamphobeteus (read more).